I’m not going to mention any brand names here (I don’t want to step on any toes! ), but have you seen those adorable white clay pots with simple words, written in black, that are popping up everywhere? 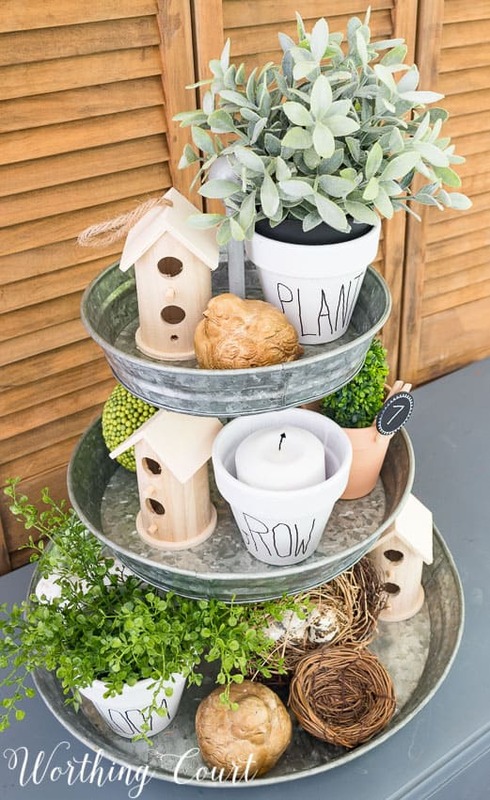 Not only are there flower pots, there are mugs, plates, trays, tea pots – all sorts of goodies. I love them! But, I don’t love their price. 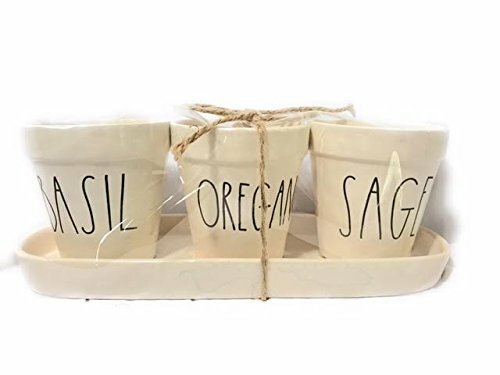 A set of three pots runs about $75 on Amazon. Ouch. While I was trying to justify spending so much on a few of the clay pots one day, it dawned on me that these would be SO EASY to do a copy cat version of for a fraction of the price! How about a set of three for under $10 as opposed to $75??? Now granted, the pot set sold on Amazon includes an oval tray and I didn’t include one of those, but if I had, it would have added about $8 to the cost. Still way less than $75! Why was I so anxious to add a set of these to my stash? Well, it’s because I wanted to use them in a tiered tray display on my screen porch. We’ve added something wonderful to our porch this year (that I’ll share later), which led me to give the whole area a bit of a freshening up. 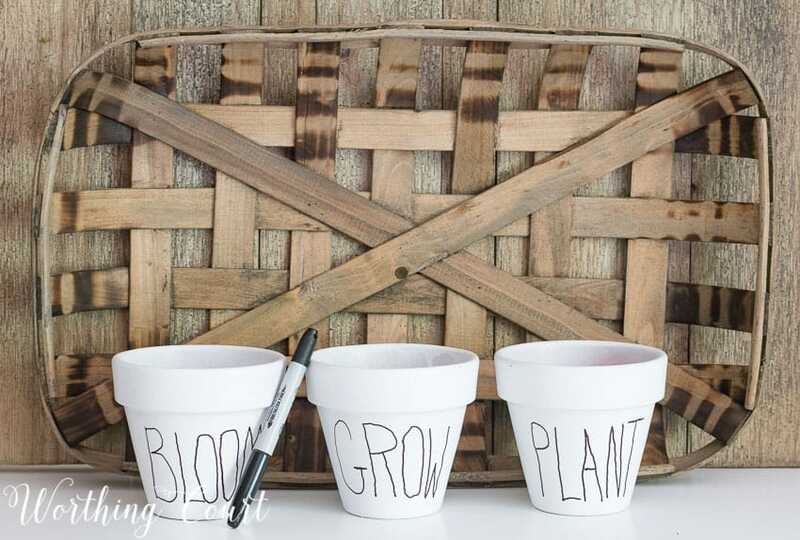 You only need three things to make these cuties – terracotta pots, white spray paint and a fine tip black marker. 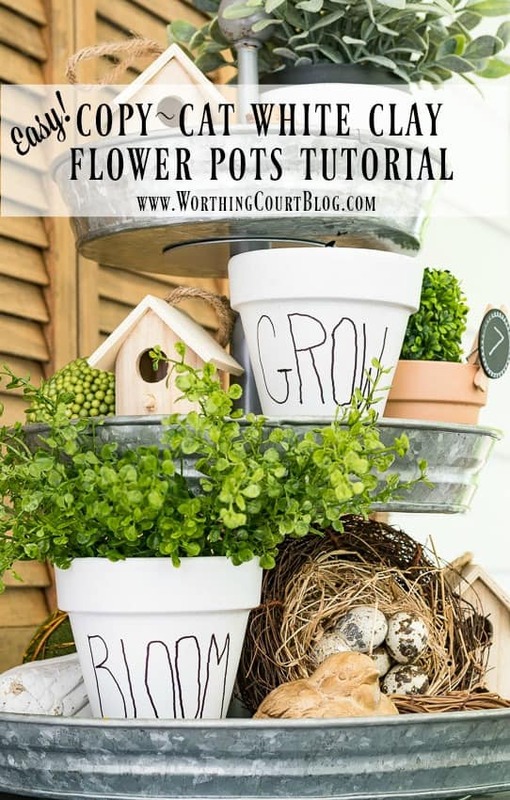 Simply spray paint the pots with two coats (or however much you need to get solid coverage), allow to completely dry and use the marker to write a word on each pot. That’s it! Honestly, this has to be the easiest diy I’ve ever done. I love them and can see myself using them all over the place! CUTE and easy, easy, easy! I love a good & easy DIY! Great gift idea too! Now why didn’t I think of that?!? lol What a cute idea and they look great on your tiered tray! Adorable, so clever and easy. Thanks for sharing. Enjoy your day. What a simple, great idea! And what a wonderful gift idea – thanks! I’ve purchased decals on Etsy using the same unnamed designers writing. I put them on my kitchen canisters and they look great. Don’t you just love those days when “it just dawned on me”? Heading out with my coupons now to pick up the pots!!! So cute. What a beautiful and easy project . Thanks for the oh so lovely and easy idea. How cute!! You sure saved enough to get a lot more extras for your porch! Don’t you love it when that happens?? Very fun! Great idea, Suzy! I have all the supplies on hand! What size pots did you use? Love them! These are as cute as a button! And I love that you don’t need to bulk up on expensive supplies and/or tools. 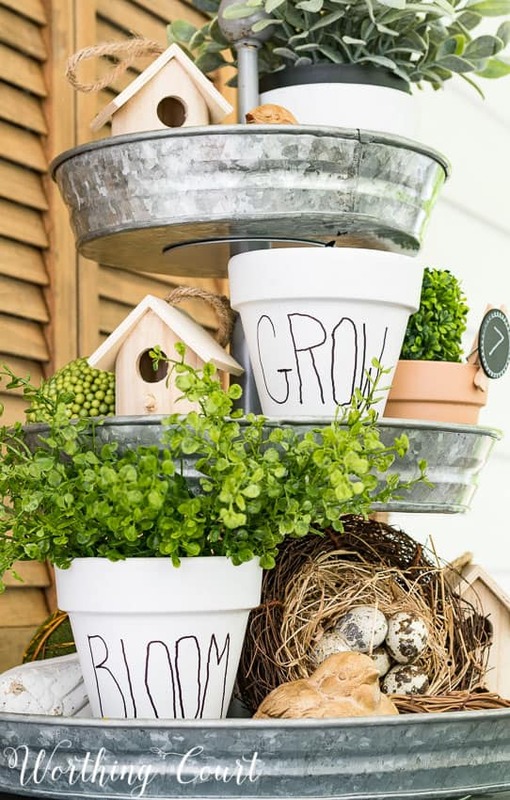 Even if your plants are ho hum, and just plain greenery, they will look adorable in these pots! A nice way to add a touch of whimsey without looking corny. Love it, a great project to use for so many occasions, and so simple! Thanks for sharing on craft schooling sunday! LOVE this idea. My husband just finished making our outdoor kitchen. This would look great in that area. Thank you for the tips. Look forward to your emails. I love these! I have been wanting some for my Garden room but couldn’t let myself spend so much. Yours are even better! I like them. Thanks for inspiring me. This is such a smart idea and I love the way they turned out. Now I want a set! This is a great idea especially because those darn planters are so expensive! Suzy, I’m so loving these pots! Such an easy DIY and saving money at the same time. Very clever of you! So cute!! This would be great in the backyard! 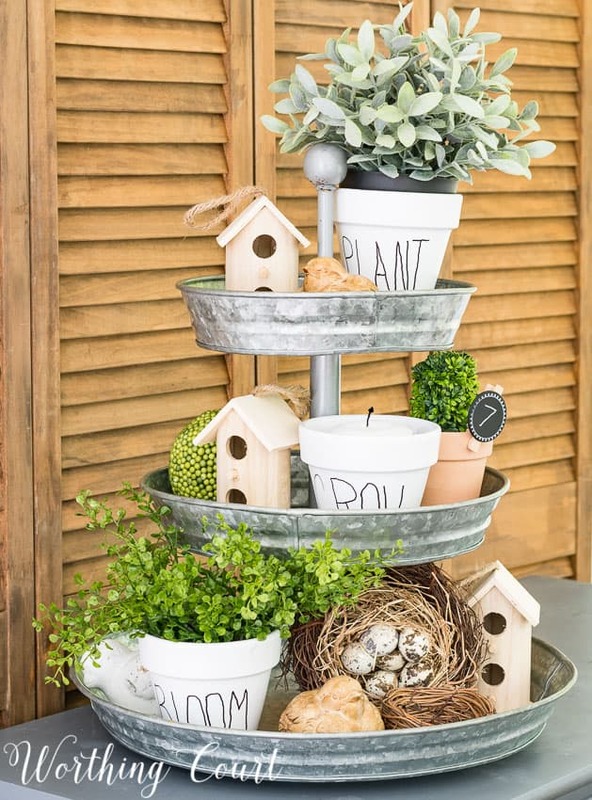 Love these ideas, and love the bird nest in bottom “shelf”. So pretty!! Love the idea. We have some succulents to put into planters. Thanks for sharing at the #InspirationSpotlight party @DearCreatives Pinned & sharing. Have a happy 4th of July. 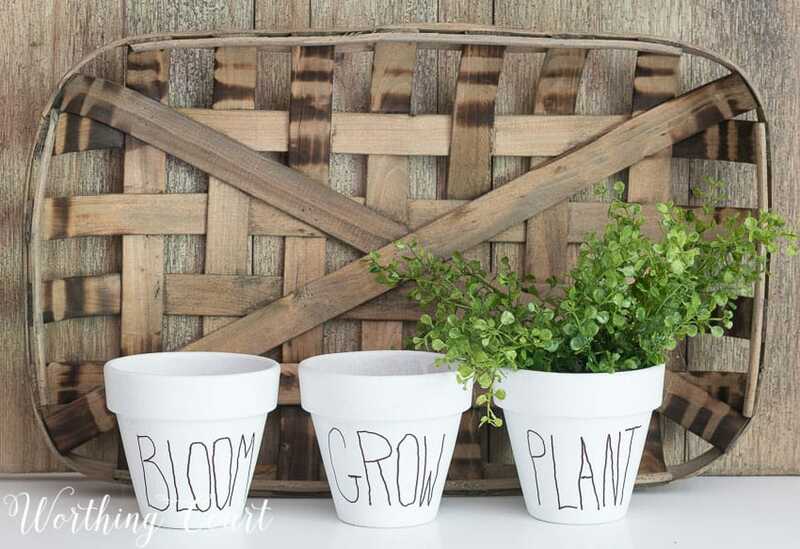 What a great Copy Cat Project, I need to try this to, Im always needing new pots for my starts have going!! And thank you for sharing on the Oh My Heartsie Girls weekly parties!!! Suzy, I’m just popping back in to let you know you were featured this week at Share Your Style. Thank you so much for linking up with us. Love this idea. Especially since I’ve bee planting a lot. Just amazing work. Your white clay pots look great! SUZY you should feel SO proud. I made it ASAP so I need white spray paint, terracotta pots and a fine tip black marker. Although it’s my first clay pots work. After finishing my work, I will share my experience. Great idea! I will have to try this and put a few on my deck. Thanks! !